Molluscum skin infections are common. 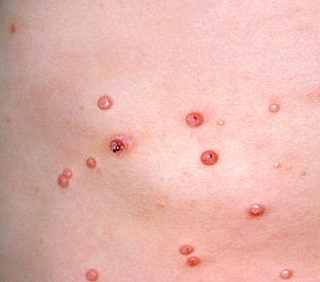 They are caused by a virus and will be seen as small and growing hard pale pink bumps on any part of the body. Luckily these annoying bumps resolve within months but may last several years. They are sometimes itchy but should not be painful. These viruses are generally transmitted by contact from another infected individual. It is harder to transmit from an object but it is possible if the original exposure was recent. In my earlier practice days we treated these by removing the hard centers of the bump by tweezers, tip of a needle or scraping with a surgical scalpel. The resulting bump heals without scarring unless a secondary infection develops after vigorous scratching. There have been suggested use of some oral medications and herbal topical treatments (see below). I do not have any good evidence that these prescription medications or herbal treatments are highly successful. I advised watchfulness and avoiding scratching to reduce spreading. Some users have recommended a treatment available for purchase online. I do have have evidence based information but this might be worth a look Online purchase available if determined to be diagnosis. For over the counter treatment consider Conzerol cream (not soap) at www.conzerol.com and is also found at www.Amazon.com. If these don’t work I refer to dermatology for liquid nitrogen application.